This card I have made for my son’s 14th birthday…he has been playing guitar for 5 years so I decided to create this music inspired card. Also done in his favourite colours of blue and green. And he LOVED it! One of the highlights of the card is the line of music that I have stamped and gold embossed over a torn edge…sets the card off I think. The tag is done in Wild Honey stains and Broken China DI then the blue bits are sprayed with ranger forever blue perfect pearls mist ~ then the guitar and music overstamped with tuxedo black ink. I have also stamped some swirls in the blue DI on the pattered paper, but it isn’t showing up all that well in this pic. The music notes are half torn, and “swiped” through the droplets of perfect pearls (this adds soooo much intensity to the end effect) to again highlight the Broken China bits. Sometimes I repeated this a couple of times, just to make it as vivid as I could. Enjoy! WOW this is awesome!! Thanks so much for playing along in Emma's(My Creative Time's Challenge)….keep up the great work. What a gorgeous card. Thanks for joining us at Aud Sentiments. This is a fabulous card for your son. 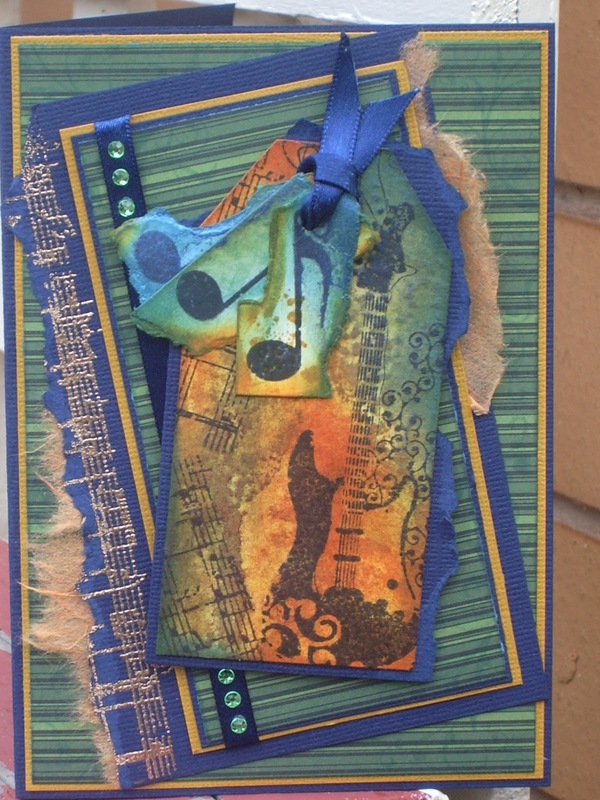 I'm so glad some warm colours crept into it so you could share it with us at the jac-inks warm colour challenge. GREAT card my friend!! Thanks for playing along! Love your card, especially the blue really makes the card pop! Thanks for joining us at Jac-inks, hope to see you again soon! WOW!! Awesome card. Thanks for joining Aud Sentiments.